This page is devoted to notable personalities and/or events that contributed to Canada’s military medical heritage. Dr Cluny MacPherson, a Newfoundlander and Newfoundland Regiment Medical Officer, was the inventor of the gas mask which was the most important protective device of the First World War, protecting countless soldiers from blindness, disfigurement or injury to their throats and lungs. For his services, Dr MacPherson was made a Companion of the Order of St Michael and St George in 1918.
handkerchief or other small piece of fabric soaked in urine. Out of necessity, Dr MacPherson quickly came up with the idea of a gas mask made of fabric and metal. Using a helmet taken from a captured German prisoner, he added a canvas hood with eyepieces and a breathing tube. The helmet was treated with chemicals that would absorb the chlorine used in the gas attacks. 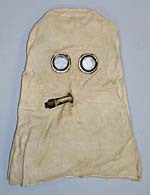 After a few improvements, MacPherson’s helmet became the first gas mask to be used by the British army.